In our fifth and final part, we’re taking you through five small market cap cryptocurrencies and blockchain projects which stand to disrupt and overhaul several major, established industries – from a project revitalizing outdated and technologically stunted practices in the legal sector, to another enabling the low-cost purchase and sale of renewable energy, all the way to a privacy coin leveraging a tongue-tying Harry Potter spell and protocol to secure and shield transactions. 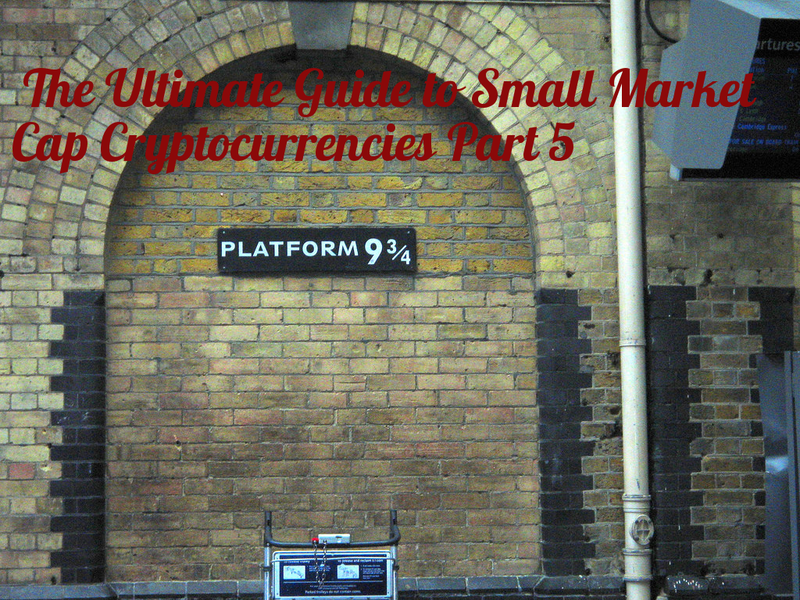 We hope you take this guide as purely an introduction to 25 of our favorite small market cap cryptocurrencies and altcoins, rather than creed. Always conduct your own research before investing in any projects, and make sure you never invest more than you are comfortable losing. We really hope this guide motivates you to look into blockchain projects further, and we’re always interested to hear your favorites and thoughts in the comments! Finally, it bears repeating that the below small market capitalization cryptos are not ranking in any particular order and their market capitalizations are only as accurate as this guide’s data of publish. Now, let’s get started and dive in to our final part of our ultimate guide to small market cap cryptocurrencies and altcoins! Launched on January 15, 2019, and free of ICO, pre-mine, and founder’s reward, Grin is a new cryptocurrency implementing the Mimblewimble blockchain protocol and geared towards privacy and scalability. Before getting into the core mission and characteristics of Grin, let’s take a look at what exactly this tongue-tying Harry Potter-named protocol is and why it has the entire blockchain ecosystem talking. Created by anonymous user, Tom Elvis Jedusor (Voldemort’s name in the French edition of Harry Potter), in furtherance of preventing “the blockchain from talking about all user’s information,” Mimblewimble is a lightweight blockchain protocol utilizing elliptic curve cryptography and providing strong anonymity guarantees for users, while radically departing from Bitcoin’s approach to transaction construction. Notably, Mimblewimble boasts confidential transactions, noninteractive merging and cut-through of transactions, and full verification of the chainstate without user need to verify the full history. Specifically, Mimblewimble “shrinks” blockchain transaction history (able to be computed by even trivial computing hardware), while employing CoinJoin (a cryptographic mechanism) to obfuscate payment and transaction details (input and output). Private: Grin supports no amounts and no addresses, allowing for complete fungibility and transactions to be trivially aggregated and hidden via a “random walk” amongst peers before becoming publicly announced on the blockchain. Open-Source: developed openly and community driven, absent of control by a single company, individual, or entity. Furthermore, Grin supports: clean and minimal implementation, Cuckoo Cycle Proof-of-Work (Cuckaroo and Cuckatoo), relatively fast block time (1 minute), a fixed block reward over time with decreasing dilution, and a smooth curve for difficult adjustments. You can read more about Grin and its design for borderless and censorship-free transactions by checking out their website, original whitepaper, and secondary whitepaper. With roughly 250 million foreign workers and immigrants remitting about USD $600 billion annually, paying punitively high remittance costs on top of lengthy transfer times, the remittance industry is in dire need of a significant overhaul. Cue SureRemit, a Stellar Lumens-based platform and ecosystem hyper-connecting immigrants (senders) looking to send money back home, while directly interacting with merchants to serve recipient needs in a more constructive and narrowly tailored way. Via the Remit token, senders are able to purchase digital vouchers, known as ‘SureGifts’, which may be delivered to billions of recipients across the globe in form of SMS or e-mail. Subsequently, SureGift vouchers can then be directly spent on goods, services, and other necessities at SureRemit ecosystem partners. Better control how the money being sent back home is spent (ex. specifying it’s to be used for food, school, medicine, and other necessities). For example, the cost of a $200 remittance to Latin America could see up to a 10% remittance fee, with Africa and other remittance corridors boasting even higher fees. There’s countless considerations which plague remittance efficacy and international transfers, including; exchange rates, synchronized amounts, personal details, transfer method, and time frame. Furthermore, cash transfers are heavily regulated, often requiring identity verification before allowing the transfer of funds from one country to another. So, what happens when an estimated 1.1 billion persons globally don’t have an officially recognized identity document? Persons making up the very fabric and workforce of our society suffer, and are unable to meet their most fundamental and basic of needs for survival and sustainability. To put such things into perspective, nearly 40% of Somalis are estimated to rely on remittances for necessities, while in 2015 alone, the Bank of Mexico reported roughly USD $24.8 billion being sent home by Mexican immigrants (a figure higher than Mexican oil revenue that year). You can read up further about SureRemit by checking out their website, white paper, and list of SureGift merchants. Interoperability between energy management mechanisms and manifold market pricing via their dual token platform (POWR and Sparkz). Think of POWR as the fuel for the Power Ledger ecosystem, while Sparkz is the exchangeable trading token for the purchase and sale of energy. Similar to how Uber, Grab, and AirBnb enable everyday persons to monetize their available and excess resources (cars and spare rooms), Power Ledger is authorizing consumers and vendors to interact at a peer-to-peer level – but this time, it’s excess distributed energy resources (DER), and in a low-cost, convenient, trustless, and entirely transparent manner. In March 2018, Power Ledger announced a partnership with Greenwood Solutions, to bring renewable energy trading to Burwood (Melbourne), Australia – Power Ledger’s first commercial deployment in Melbourne. Power Ledger’s distributed and trustless ecosystem and trading platform eliminates the need for centralized and ministerial settlement and execution of millions of transactions (at rapid speed), expanding the traditional transactive energy economy from a bilateral one to a multilateral ecosystem. And, consumer protection and interest preservation are at the very heart of it. Power Port: for electric vehicle metering and settlement (note that globally, 2015 witnessed nearly 1.3 million electric vehicles hit the road, across almost 1.5 million charging stations). C6 and C6+: automated reporting for generation of carbon credits and certificates. Virtual Power Plant 2.0: a next generation amalgamation of the xGrid (P2P trading via a regulated electricity network) taking virtual power plant concepts to a new level, creating a conduit for transactions between owners of DER and multiple counterparties. To read up further on Power Ledger, various partnerships across Australia, Liechtenstein, and New Zealand (to name a few), head on over to their website and check out their white paper. Minimizing exorbitant custodial, legal, and administerial costs. Simply put, Agrello in in the midst of uprooting three core issues plaguing non-machine readable contracts; creation scope and complexity, tracking restrictions, and enforceability. Agrello also provides a legal contract template library and platform, where local community legal experts and practitioners share and provide up-to-date and “best practice” contract templates. Execution and Monitoring: debtor signs the contact with their Agrello ID, selects payment, and both may now monitor the contract and receive notifications when significant events are triggered. Some have confused Agrello’s quiet social media presence for project despair and stagnation, however, Agrello noted in a recent blog post that they are moving towards a more “concentrated and business-based communication,” meaning everyday communication isn’t priority (especially in wake up building out their technology and product). Keep in mind that Agrello website changed a while back, so head on over to https://www.agrello.io/ and check out their blog for all the latest updates. Addressing the most substantial hurdles slowing enterprise integration onto the blockchain – difficulty of blockchain network deployment, development of distributed applications, and their packaging into an understandable and externally controllable corpus – Neblio is a secure, open-source distributed platform and next generation blockchain for enterprise solutions, applications, and services. Currently, businesses and enterprise looking to integrate onto the blockchain are stuck somewhere in the between, without cost, time, and overall goodwill required to create and develop their own customized blockchain – longing for robust, customized tool boxes, comprehensive developer suites and ecosystems, and pre-packaged deployment platforms to ease and serve their reconditioning of traditional database architectures. Architectures which have failed to modernize and meet user, consumer, and enterprise demand. Distributed API networks: spanning countless common programming languages (JS, .NET, Java, Node.Js, GO, PHP, Objective-C, and Python) – sanctioning developers to connect and interact with the Neblio network without needing a deep familiarity with blockchain technology. Secure Identity and Records Management: from health records to financial transactions, Neblio ensures secure and decentralized records management (in any form). Internet-of-Things and Big Data: providing a decentralized method for next generation IoT devices for product and service authentication and integrity. Issuance of NTP1 Token: platform users and enterprise are able to issue their own NTP1 token (in just two clicks), which can be used to track assets, represent event tickets, facilitate a token sale, and more. Blockchain consulting: for bringing customers up to speed in their deployment of networks and applications. Neblio’s suite of enterprise business solutions is at the very forefront of bringing blockchain technology to businesses and the mainstream, by allowing enterprise and services to launch at rapid speed all thanks to “quick and painless” and easy to integrate blockchain infrastructure and applications. Additionally, Neblio is secured by 100% Proof-of-Stake (PoS) consensus, whereby NEBL users take their coins in order to secure the network. You can calculate your potential NEBL staking rewards by checking out either one one of the following calculators/pages: StakingRewards.com or NeblioStats.com. You can read up further about Neblio by heading on over to their website and brushing up on their white paper. We also recommend checking out the Neblio blog for the latest updates. And there you have it! The Ultimate Guide to Small Market Cap Cryptocurrencies. If you enjoyed our guide and took something of value away, then please let us know by clapping, commenting, or following us! This year, we’re focusing on putting out as much content as possible, and are always looking for new blockchain projects and altcoins to look into further, so please let us know your favorites in the comments or via private message (@blockchainseo). To receive updates on our most recent news pieces and articles, follow us on Medium or Twitter. Once again, you can find Part 1, 2, 3, and 4 all on our Medium page and website. Happy HODL’ing and make sure to conduct your own research and due diligence before investing!